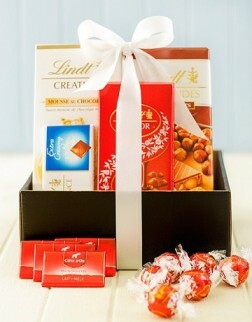 Send decadent chocolate hampers to Durban in South Africa. From Lindt and Ferrero Rocher for the discerning chocolate lover, to Nestle and Cadbury for the more budget conscious, we have a chocolate hamper that will be sure to surprise and delight your loved one. Our chocolate hampers are available for next day delivery throughout Durban if ordered before 12pm. She absolutely loves them - thank you so much again for going to so much effort! And she's never had flowers delivered to her at work before (I didn't realise that!) and so she's even more chuffed. Thanks again and I'll certainly be recommending you and using you again!